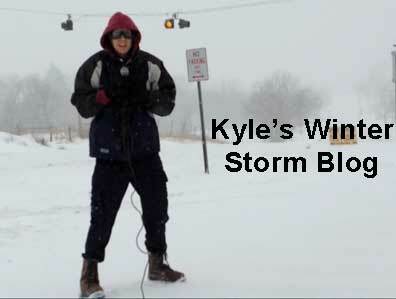 QuickNewsNow always strives to provide the most up to date news as quickly and accurately as possible, particularly during winter storms and at the same time share what is happening in other parts of the state. Throughout the day I will be updating this blog quite frequently with photos from readers, road reports, and whatever else I stumble upon. (I have lots more to post but just wanted to get things started. Hang on cause it’s going to be long day. Hopefully I can keep you entertained. 9:45 p.m. -We all complain about being “plowed in” well I may have come across the solution to our complaining. I came across this diagram on Twitter that was tweeted by Brian Bolen and to me it makes perfect sense. He says to shovel about a 6-8 foot long and 3 feet wide “swath” of snow away from the street. 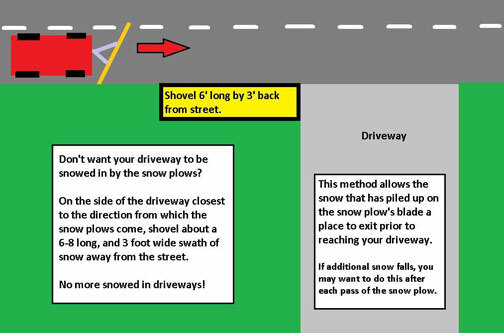 He always says this method allows the snow that has piled up on the snow plow’s blade a place to exit prior to reaching your driveway. Brilliant! This sounds like a great idea however there is a little work involved but seems like it will pay off in the end. Just thought I would share. **Bonus reminder from one fellow guy to another Valentines Day is coming up. This photo was taken by Ryan Struttman. 8:00 p.m. - I apologize for sleeping at the wheel but I’ve been busy the past few hours, part of which did include a little power nap. A quick update on highway conditions. We just received a road report from Angela Foldi that Highway 100 is completely covered on both sides and took her about 45 minutes to get to New Haven from Washington. 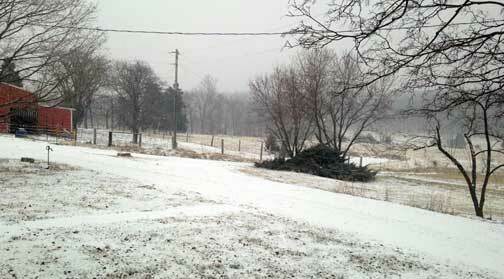 Working on a time lapsed video from snow falling between 12 p.m. and 3 p.m. Will have that up here shorty. Be safe and stay inside where it is warm. 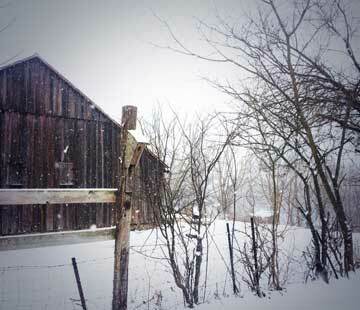 This is a pretty photo from Beaufort, Mo earlier this afternoon. 1:30 p.m. - Our good friend Dylan Fries sent us this photo from Point Lookout, Mo, near Branson where he attends College of the Ozarks. He also said they have about an inch of ice and 2’’ of snow. 1:15 p.m. - Here's a big shocker! 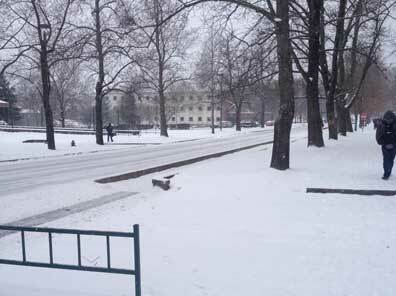 MoDot officials say travelers out on the roads are making it difficult for them to plow their routes. These are the same people who complain about the roads not being cleared. Stay home people. How many times can you tell your boss that you couldn't come into work because MoDot said to stay home. Take advantage of the opportunity. 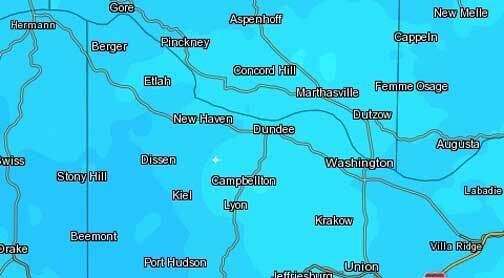 12:30 p.m. - As you can see in the radar image below, areas in darker blue are getting heavier snow fall and the wide spread difference just between New Haven and Stony Hill. 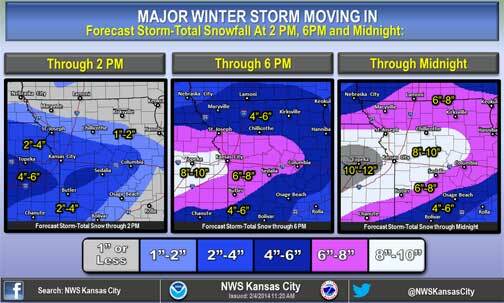 Below was just released by the National Weather Service on snow fall totals. Gayle Lutz just sent us this photo. 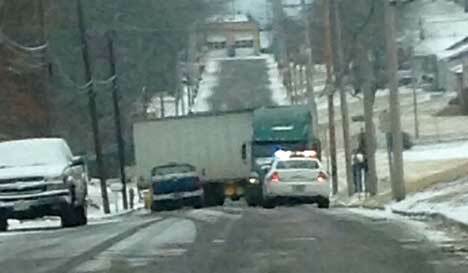 Not exactly sure what caused this tractor trailer to jackknife at the intersection of Circle Drive and Maupin Street. We will see what we can find out.